The goal was to keep things simple. 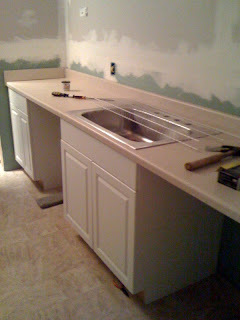 For example, the width of the room was dictated by the the width of the pre-constructed counter tops. 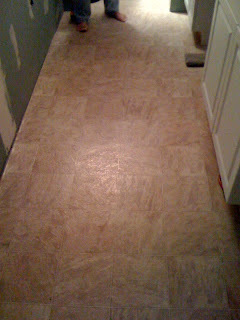 The linoleum on the floor was a simple "glue it and roll it" from home depot. I originally wanted to go super cheap and get everything from craigslist or freecycle, but realizing in my absence that the easier we can make it the less guilt I'll have by leaving the construction work to everyone else. 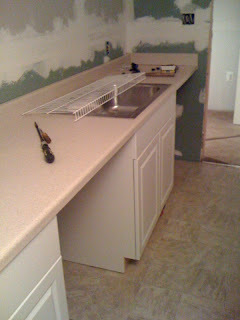 Seems like this project will be finished and Amy will have her kitchen back in no time! Next step is a 3rd coat of mud on the wall, sanding and then some paint. A special thanks to my brother Tony, my Dad and Uncle Ken for their hard work on my juice room while I'm busy working hard on other things. Meanwhile, I will be at the Gerson Hospital @ Baja Nutri Care Center. We will be picked up in the morning and then driven across the border where my therapy will begin. My goal is to return home and leave my Melanoma in Mexico.